Seeing other people fail is comforting. We can relate to failures. Julia Child's charm only increased when she dropped an omelet on the ground or spilt an entire dish onto her counter. I suddenly think, "Shoot, I can debone a duck. I might freak out and drop it on the floor? Who cares!" Let's boldly attempt life (and recipes) and boldly share our failures. "I feel terrified even thinking about the kitchen. We just go out." "I have sat in the parking lot of a grocery store and cried because I couldn't think of anything to feed my family." "I read that recipe, but I just got scared." "I smoked my entire apartment. I don't want to cook with xyz anymore." They say they admire the way I can whip up a dish in the kitchen, so I hope to comfort them by sharing some (the list is endless) of my kitchen failures. 1. The other day I made lentil soup. The flavor was perfect. But I left it on low heat for about 1 hour too long. It turned into a pot of mush. A big pot of brown mush. I served it over rice for my lunch today. It looked gross. I ate it when I was all by myself. 2. I burn bread every time I toast it. Every time. I have to scrape off the top layer into my sink, which covers my kitchen in a weird black dandruff. 3. I have a tiny cutting board, and I get a little out of control when I chop. Little slices of mushrooms and onions cover my kitchen floor. You can feel them crunch when you walk around. This usually makes me curse profusely. 4. I made zucchini pancakes the other day. I was trying to be healthy but delicious. They were disgusting. They all went in the trash. So there's a few. 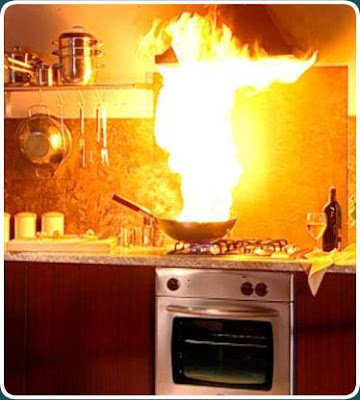 What are some of your kitchen fears/failures?